Even if you’re not a fan of soccer you can’t help but hear all about the World Cup and the beautiful country of Brazil. My husband actually served a two-year mission for our church in Brazil before we were married. He often talks about Brazil and mentions those favorite Brazilian foods. 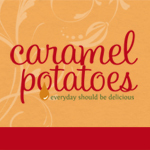 He would frequent the local bakeries and pick up a baked good for lunch or dinner. 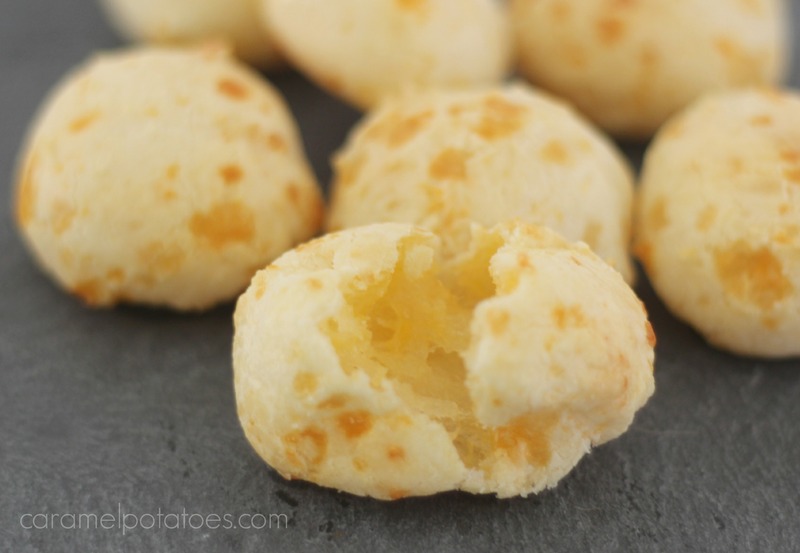 This pão de queijo or Brazilian Cheese Bread as it is known to me, were some of his favorites. It makes sense, since I am a food blogger after all and it seems logical that I would eventually make something Brazilian for him. Well, finally! These little balls of deliciousness did not disappoint. The entire batch was gone within minutes. And for my gluten-free friends, go ahead and eat this bread. It is gluten-free using only tapioca flour. 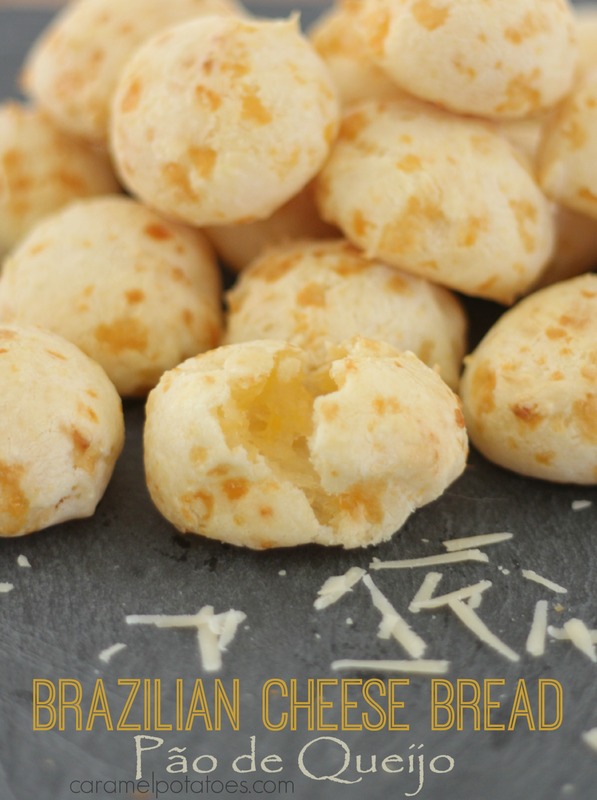 As you watch the World Cup and cheer on your favorite team, a little Brazilian Cheese Bread may be in order. Afterall, every team is playing in Brazil. Combine the milk, oil, and salt in the saucepan, and whisking occasionally, bring it to a gentle boil over medium heat. Remove from heat as soon as you see big bubbles coming through the milk. Add all of the tapioca flour to the saucepan and stir until you see no more dry tapioca flour. The dough will be grainy and gelatinous at this point. Transfer the dough to the bowl of a standing mixer fitted with a paddle attachment. (Alternatively, you can do the next few steps by hand. Be prepared for a work-out.) Beat the dough for a few minutes at medium speed until it smooths out and has cooled enough that you can hold your finger against the dough for several seconds. Whisk the eggs together in a small bowl. With the mixer on medium, beat the eggs into the dough in two additions. Wait until the first addition has been fully incorporated into the dough before adding the second. Scrape down the sides of the bowl as needed. With the mixer on medium, beat in the cheese until fully incorporated. The resulting dough will be very sticky, stretchy, and soft with a consistency between cake batter and cookie dough. Transfer the sheet with the puffs to the oven and immediately turn down the heat to 350°F. Bake for 25-30 minutes, until the puffs have puffed, the outsides are dry, and they are just starting to color. Cool briefly and eat. Leftover puffs can be kept in an airtight container for up to a week and re-crisped in a warm oven or toaster oven. If you need to bake a second tray, be sure to return the oven to 450 before placing tray in the oven.